Need Shrimp? They’re Right Off The Boat at Florida Cracker Shrimp in Horseshoe Beach! You can’t miss Florida Cracker Shrimp and Bait Company. It’s alongside the canal on CR351 in “downtown” Horseshoe Beach, FL. 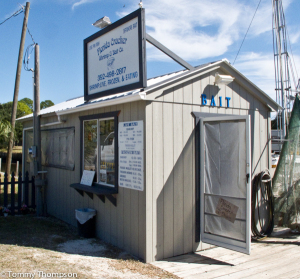 If you’re looking for really fresh shrimp, take a leisurely drive to Horseshoe Beach, in Dixie County. It’s about a 24 miles trip from Cross City (via CR351), but it’s worth it. Tim runs a couple of shrimp boats from his small roadside shop, guaranteeing some of the best product around. They’re often fresh caught, but he usually has a freezer full of sorted, heads-off, shrimp for sale at very reasonable prices. In December 2014, a two-pound bag of medium-large shrimp was going for $15. Or, if you’re just heading to Horseshoe for some fishing, stop at Tim’s for some live shrimp. 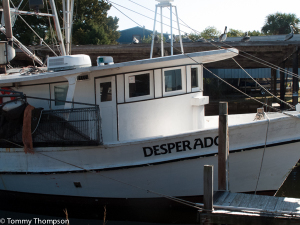 His “boat to live-well” prices for shrimp can’t be beat! Are the shrimp fresh at Florida Cracker Shrimp and Bait? You bet! Tim’s boats dock just a few feet from the shop.